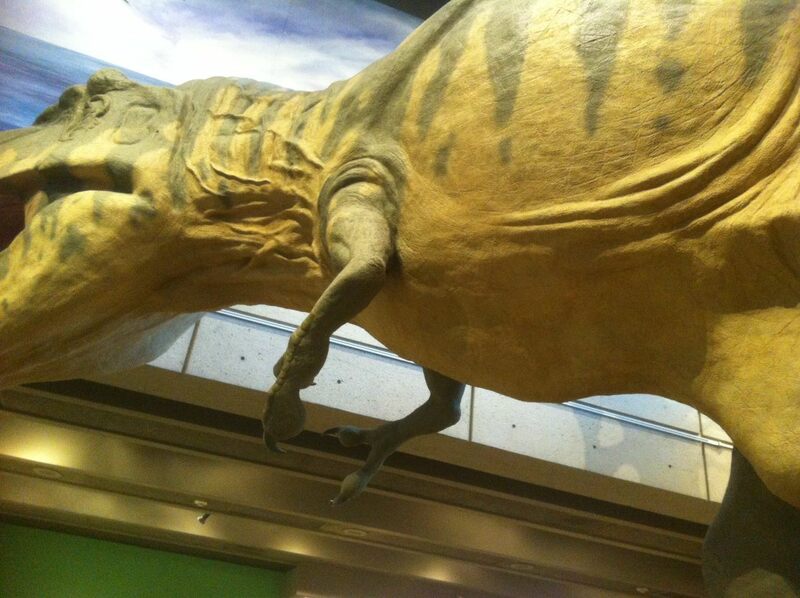 Did dinosaurs have belly buttons? I know what you’re thinking. Probably something very similar to what I thought: No. A belly button is the scar left when the umbilical cord drops off after birth. Mammal embryos need an umbilical cord to carry food and water to them as they develop in their mother’s womb. Dinosaurs hatched from eggs, therefore, they wouldn’t need this sort of on-going connection between mother and child. No umbilical cord, no belly button. Case closed, right? Obviously not. Just consider the source. While The Five-Year-Old is often interested in hearing what I have to say about any given topic, experience has taught her that Mommyo is not the Font of All Wisdom in our family. That title belongs to Daddyo, who unfortunately was not with us at the time. After a great deal of earnest reflection and pointed questioning, The Five-Year-Old decided to accept my statement that only mammals have belly buttons as a working hypothesis, but made it very clear that it was an idea she wanted to test. Immediately. At least, the evidence available to us at the time. So we trekked down to the dinosaur exhibit. First to catch our eye was Cliff, the museum’s nearly complete Triceratops skeleton (shown in the picture at the top of this post). 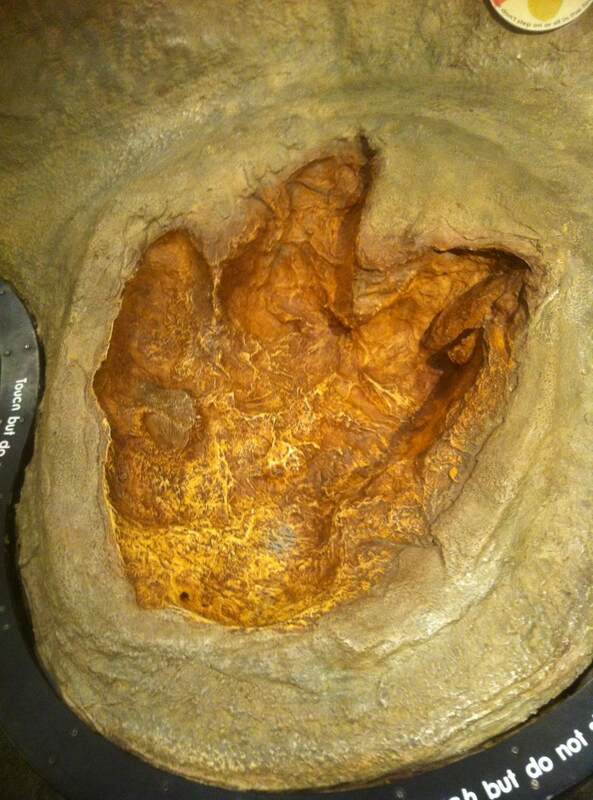 Next, The Five-Year-Old and I examined a very large and very shiny dinosaur footprint. Although dinosaur footprints are always engaging, this one had even less to tell us about dinosaur belly buttons than our old buddy Cliff. We needed something with soft tissue, stat. Where can we find a dinosaur with soft tissue? Not at the Boston museum, that’s for sure. The only relatively complete fossilized dinosaur that we know about is Leonardo, the mummified 77-million-year-old juvenile duck-billed dinosaur currently residing at Phillips County Museum in Montana. Leonardo does boast a segment of fossilized dinosaur skin, so naturally The Five-Year-Old proposed that we catch the next flight out and examine him to see if he had a belly button. Sadly, The Five-Year-Old’s busy playdate schedule ruled out an immediate departure for Montana, so we were forced to make do with the many artist renditions of dinosaurs surrounding us instead. None of the dinosaurs painted on the walls appeared to have belly buttons, although as The Five-Year-Old glumly pointed out, it was possible that the artist had simply forgotten to draw them. Which left the Museum’s very large (and as far as I know unnamed) model T. Rex. Close examination of his stomach revealed no belly button. But you and I both know what’s coming, don’t we? In short, as The Five-Year-Old emphatically declared, the pressing issue of whether dinosaurs had belly buttons could not be decided from such inconclusive data. Given the lack of readily available fossilized belly skin and my firm stand against The Five-Year-Old’s proposal to set up an incubator in the guest bedroom to grow a clutch of dinosaurs at home, we had no choice but to venture into the perilous field of comparative anatomy. Comparative anatomy is the time-honored technique of examining the features of creatures living today to make educated guesses about what similar structures in extinct animals might have looked like. While the technique can be helpful, it has also been known to lead paleontologists badly off-track. 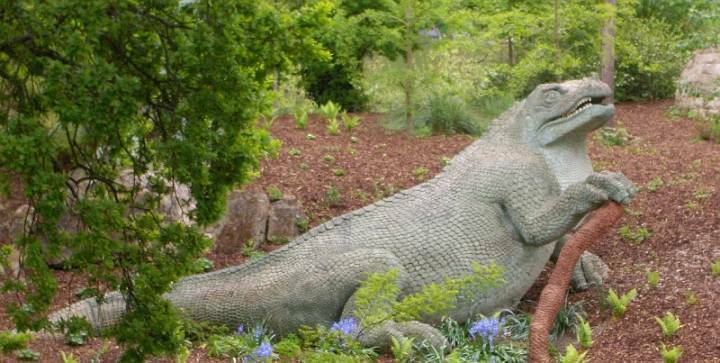 Like that time Richard Owen declared that since Iguanodon had teeth like a modern-day iguana only much larger, Iguanodon must have looked like an iguana, only much larger and with a horn on his nose. I’ll say it for you, Richard. Oops. Still, comparative anatomy was the best tool we had left under the circumstances, so The Five-Year-Old and I went with it. Birds are currently believed to be the dinosaurs’ closest living relatives, so when I proposed that we ask the iPhone whether birds have belly buttons, The Five-Year-Old agreed, even though it didn’t sound like nearly as much fun as hatching her own Giganotosaurus. According to The Cornell Lab of Ornithology, the answer is a somewhat surprising yes, at least for baby birds. Turns out that there is a cord that connects the developing embryo to the yolk sac in the egg. When birds hatch, they have a scar where that cord used to be. The scar remains visible while the bird is a nestling, but disappears as they grow older. In short, baby birds have some version of a belly button, but adult birds don’t. Given this, The Five-Year-Old and I have refined our hypothesis. Pending further investigation, we now believe that like birds, newly hatched dinosaurs had some version of a belly button, but that their belly button scar would have faded or disappeared altogether by the time they were full-grown. At present, our best hope of confirming this hypothesis may be Leonardo, even though at an estimated three or four years old at time of death, it is hard to describe him as a hatchling. Still, while we couldn’t read too much into the absence of a belly button, the presence of one would be pretty exciting. 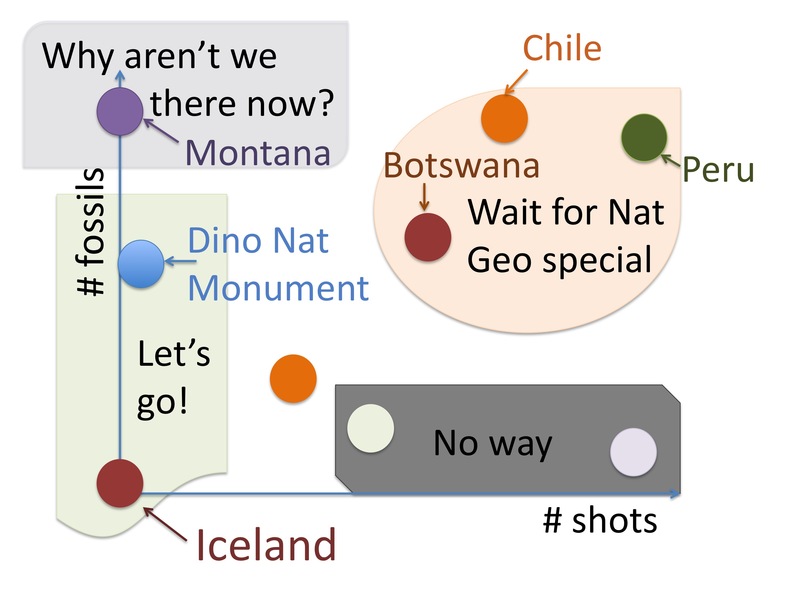 Sadly, direct examination of Leonardo’s belly will have to wait, as the parental half of this investigative team is standing firm in her opposition to The Five-Year-Old doing field work in Montana this summer due to scheduling conflicts. Inquiries are pending with the Phillips County Museum curators, however. If they respond, you can be sure we will report back. So far, they appear to view my emails asking about dinosaur belly buttons as being the product of just another Internet crank. In the meantime, we’d like to know: Have any of you had the chance to examine Leonardo? Does he have a belly button? Looking for more Caterpickles Investigative Reports on Dinosaurs? Why did they think T. Rex stood with his tail on the ground? Why did they draw that dinosaur underwater? Update to a Past Caterpickle: Why did they draw that dinosaur underwater? Could a T. Rex lift a woolly mammoth? How long will it take my wishbone to fossilize?